The race for the next President of India turned complex with two important supporters of the Congress-led United Progressive Alliance putting three new names on the table. 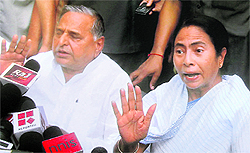 Mulayam with Mamata Banerjee in New Delhi. The police and intelligence agencies have so far not found �any evidence of spying or any security threat to the Dalai Lama following the arrest of eight Taiwanese nationals from Chauntra in Mandi district where they were staying in a highly fenced palatial residence, which is under construction, and worked as �interior designers and painters�. The Supreme Court today refused to provide any relief to the government on the controversial 4.5 per cent sub-quota for minorities even as the Centre clarified that the reservation would be restricted to students belonging to the most backward classes among the Sikhs, Christians and the Muslims. When the inmates at Rohtak shelter home were given a white powder, they had no way of knowing that it was not tooth powder. It was only when they were forced into sexual encounters at a guest house near the Rohtak bus stand did they realise that the white dust was not what they thought it was. The Delhi High Court today sought the response of the Centre and Air India within a week on the striking pilots� plea for immediate payment of their salaries and other emoluments. Legendary ghazal singer Mehdi Hassan passed away after protracted illness at a private hospital in Karachi on Wednesday. He was 85. Hassan had been battling paralysis, lung, chest and urinary tract disorder for the past over 12 years. On May 30, he fell severely ill and was admitted to Agha Khan Hospital in Karachi where he had been on life-support system since then. teri mehfil mein lekin hum na honge�"
Ghazal and Mehdi Hassan will remain inseparable in public memory. And a love affair once begun with his serenading voice will never end. Hassan's death after a prolonged illness in a hospital at Karachi, Pakistan, on Wednesday was that of his body. Born in undivided India (1927), at Luna in Rajasthan, his music soared into the skies, rendering the lines drawn as boundaries futile.